Welcome to the SIERA webpages! Please contact Tom if you are interested in volunteering to cover a section this year. Additional info and links will be posted as they are received. 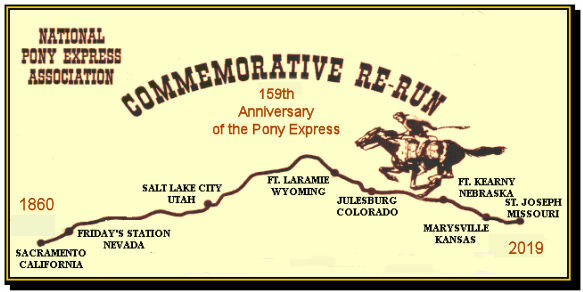 SIERA has provided communications for the Pony Expres Re-Ride from 1989 to 2019. That's 30 years of continuous support!. It's a lot of fun too. Please consider signing up for a section or two. You won't be sorry, I can assure you. Contact Tom Tabacco if you are interested joining the team. This event will be held at the Minden-Tahoe Airport. from Carson City, Nevada to Pearsonville, California which is just north of Ridgecrest. All of the links are along the US395 corridor. Come join us for a nice breakfast and coffee, meet with fellow "hams". Come join us for a nice lunch, meet with fellow "hams". SIERA is an acronym for "Sierra Intermountain Emergency Radio Association". We are a non-profit corporation for education and scientific purposes that provides organization and training of licensed amateur radio operators so they are capable of maintaining radio communications, as a public service. please look over the many links on this website and feel free to contact us for further information. Use the menu links above to navigate the SIERA webpages. PLEASE feel free to contact us with any suggested corrections and suggested links for this web page.